I recently had a terrible day. 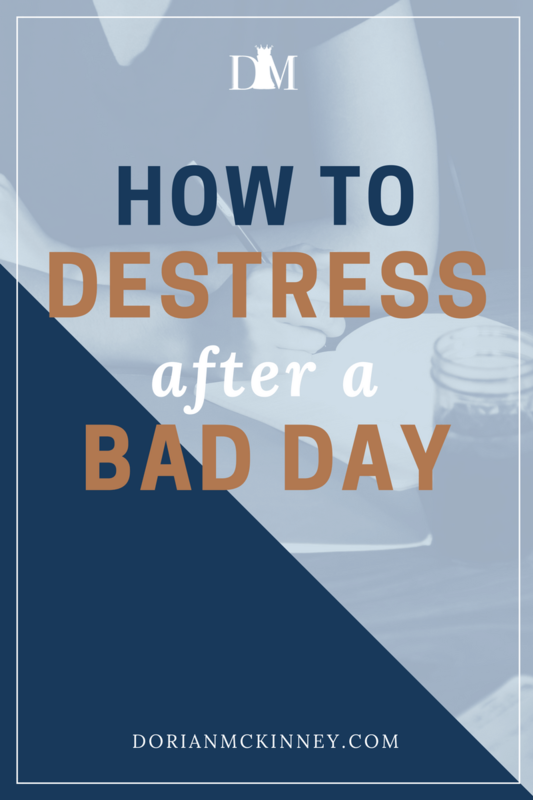 It got me to thinking about how do you de-stress after a bad day. At various points in our life, we all get exhausted, stressed, upset, or hear terrible news. I am going to tell you 5 ways that work for me. We can never be certain what will happen every day and every minute of our lives. Moment to moment brings experiences from which we can be happy, fun, and excited. Sometimes, it is the other way around, especially when everything is going beyond our limits, our plans, and expectations. When things don’t happen the way how we planned, we end up feeling frustrated and unhappy. It feels like the world is going against us and we become completely overwhelmed by the situation. In times like this, it is important to manage the situation and allow ourselves to stay focused. The good news is, there are ways for you to recover when confronted by the same situation. Here are the five steps or tips to de-stress yourself after having a very bad day. Grab a Glass of Water, then Drink. When you feel like the energy inside your body is getting out of control or you are about to freak out, the only thing you need to do is to drink a glass of water. Water is best known for its tranquilizing effect that soothes and calms the nerves so that our blood pressure will gradually slow down. Find Time to Exercise. When we are experiencing stress, r having a bad day, our bodies react to it. You have to remember that what we feel inside will manifest outside. So, instead of stressing yourself with negative thoughts, why not divert your attention by doing some exercise routines. Exercise will help you to re-channel your energy and release that negative energy you have inside your head or body. Laughter is a Medicine. Laughter can also light up your mood. It is the best reminder for you to stay focused. When you laugh despite troubles or no matter how difficult the situation is, it can bring you hope that somehow bad days will be over and you can recover soon. Meditate. One of the most powerful tools for fast recovery would be to meditate. Meditation has been used by people to achieve quietude and peace. It allows the mind to stop thinking about its preoccupations, thereby, achieving a great amount of serenity. In meditation, the mind and body relax and are able to maintain a certain balance needed to obtain a positive high frequency that will rejuvenate energy. Invite someone and have a cup of Tea. Drinking tea is their common stress-reliever. Tea can help you relax because of its soothing aroma and is free of caffeine. While drinking a cup of tea, it sets the tone to get some sort of recovery by relaxing your mind and letting go of accumulated negative vibes. It is important to know how to transform bad days into good ones. Remind yourself of these simple five steps and start enjoying life and let go of troubling thoughts. Stay happy and be always happy. Question: How do you de-stress after having a bad day? You can leave a comment by clicking here.